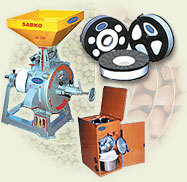 Sabko Industries: Sabko Industries represent a key element in the group corporate strategy. It offers a wide range of grinding machines for both commercial & specialised purposes for grinding Corn, wheat, henna, snuff and other specialized grinding machinery. The large scale, vertical multipurpose Iron and Steel shaping, cutting and bending machines are a feather in the flagship status in the company within the group. The ultimate motive of Sabko is to become the "Natural For Quality", which is sustained by continuous R&D, best quality inputs and raw materials and excellent craftsmanship. Thus, the customer gets full satisfaction and faith when the name "SABKO" is associated.